Transitioning from one scene to the next in a novel is important enough to warrant a second post. I first presented this in 2013. In my last post I promised to share some more transitions from my novel, FREEDOM’S HAND, to show how this necessary device can strengthen a writer’s story. It’s time to pay off. The early scene where Nathan Adler and the Lowe family first arrive at Lager, the desert concentration camp built by the white supremacist group, Freedom’s Hand, is a lengthy one, with no transitions. Nathan, who survived Auschwitz fifty years earlier, is within himself, not willing to believe the nightmare is happening again. Then, the camp’s “technical advisor,” an old man named Heinz Kell, confronts Nathan and comments on his sturdy appearance. The words ripped through Nathan’s apathy. A haze began to dissipate; slowly. But before he could see, he heard. No more haze. Alert, Nathan’s eyes met those of the other. In Nathan there smoldered an emotion beyond hatred, an aching of the soul more malignant than any cancer. Fists clenched, Nathan turned his left arm, revealing the indelible tattoo of numbers. Kell nodded, and for the first time smiled. Early winter in southwest Poland. It had been a cold, threatening day. But even with occasional rain, the dark smoke of the crematoriums had risen without pause since before dawn. 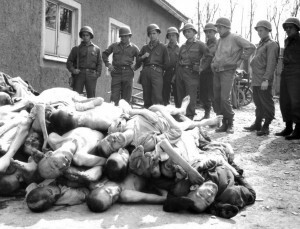 Nathan Adler and the rest of his Kommando had been transporting bodies from the gas chambers to the pits behind one of the crematoriums. In his four months there, it was the worst thing he had to do. Some of the men in his work detail did not care anymore. Mussulmans, they were called. Emotionally dead, their bones protruded through skin that was like dried paper, causing terrible sores that festered and smelled vile. Tomorrow, or the next day, it would be their bodies thrown on the pile. 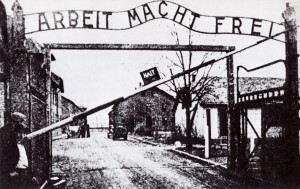 The gassing had been stepped up; new arrivals to the Auschwitz-Birkenau compound were being put to death in droves. Promises of a warm shower and well-paid work afterward were no longer made. They were crammed into the rooms by force. With an allocation of twenty minutes for the incineration of every three corpses, the pits were becoming more filled. Heinz Kell tortured and murdered countless prisoners in Auschwitz and was Nathan’s primary tormentor. The flashback ends with Kell doing something unimaginable to Nathan, and another transition takes us back to the contemporary story and a continuation of their confrontation. I won’t reveal what happens there. 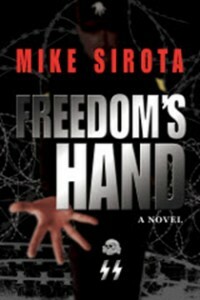 Flashbacks are key later on in Freedom’s Hand as a means of showing readers how the Commander, a hate-filled man and the architect of Lager, became the monster that he did, all the way back to when he was a small boy. But the transitions to those past scenes don’t have to be dull and stiff. We learn early on that the Commander’s first name is Martin, and the flashbacks are preceded with him talking to his friend and second in command, Lewis Hanfield. For example, Martin has just quoted a passage from Hitler’s writings and says that der Fuhrer would have exterminated all inferior races. The boy waited at the bottom of the long, carpeted stairway. Descending with practiced steps the tall, elegant woman continued past the landing where she often paused for effect, joining him. The smile that millions loved was, now, just his. They weren’t supposed to bury the dead on hot days. Funerals were open umbrellas and cool, steady rain beading on shiny black limousines, and a hurried service so that no one would have to stand in it for too long. Hot days were beaches, baseball, shady picnics, not people in dark clothes and ties and veils swearing at the corpse for being inconsiderate. The young man stood at graveside between his father and his mother’s sister. A rainbow of flowers engulfing the casket gave a false image of life and vibrancy. He chose instead to stare at the black, yawning hole, which put into better perspective the reason why they were all there that morning. The examples above were all transitions within chapters. But a transition from one chapter to another can also be effective. I present the following one because a number of readers have commented on the fact that it stood out in their minds long after they’d finished the story. Only two had raped her during the night. One had been a young corporal, quiet by their standards. Susan had done whatever he wanted, and he had left quickly, satisfied. But the second had been the fat man who had threatened her in the Terrible Room. Smelling of sweat and filth, Tug Dickey had laid in her bed for two hours, cursing her for the time it took to arouse his limp manhood, making her do it a second time before he left. When he was finally past the door she stripped off the linen, threw it in a pile with the negligee he had selected, and vomited until there was nothing left. To reiterate: strong transitions can be an effective tool in creating a more powerful story. Happy transitioning!